I openly admit it. I am a court show addict. I love watching People’s Court and Judge Mathis especially. Both judges are very entertaining while at the same time very knowledgeable. Both shows air new episodes about five times a week and without fail at least one segment on one episode will be about either loaning someone money or co-signing for a loan. The borrower always promises to pay promptly when they receive their tax return check. Then months or even years later both sides find themselves in court with the defendant almost always saying it was a gift. Another thing I have noticed about this type of case is that the plaintiff is usually a woman and the defendant typically a man, but is a woman a good amount of the time. In these economic times it’s no wonder people need to turn to friends and family for help. This is why many financial experts say it’s better to give an amount you can live without rather than loan money you don’t have with the expectation of getting it back. Meaning, if the borrower is asking for $500 and you know you can give them $250 without feeling it, opt to give them the $250 instead. Here’s what else I notice about these types of cases, the loans are for non-essentials. These cases are rarely about loaning someone money to keep the lights on or feed their children. It’s to get a cell phone, rims on a car, or a car period. The loans are often made to people who couldn’t get an auto loan or a cell phone in their own name due to their bad credit. They have bad credit because they have not paid their bills for any number of reasons. The borrowers were high risk to begin with. But they’re a friend, a family member or a boyfriend/girlfriend. Not co-signing for a loan is not reflective of you as a person or your level of loyalty. Anyone who would use that as rationale is not really your friend. There are circumstances where co-signing is an acceptable risk. If it’s your child and you need to co-sign their student loan for example. When I was in school I needed a few thousand to help cover my last semester in school and my uncle and his wife helped me out. I made sure that was the first bill I paid every month. The key here was that it was my last semester in school, I wasn’t quitting and the loan wouldn’t have to be repaid until I was employed. Also, the amount of the loan was relatively small and it was something that they could cover if absolutely necessary to preserve their credit rating. Make no mistake, they would have come after me for the money. I was a risk, but a low risk. My credit score was fine but I wasn’t working while in school, so I was without an immediate source of income. 1. If the borrower stops making payments, the bank will come after you. If you decide it’s a situation where you feel compelled to help make sure you can cover the monthly payment yourself. And make arrangements with the borrower to pay you back and to take over the payments again. Have this agreement documented in a promissory note. 2. You take most if not all of the risk. The bank will always get its money. In co-signing for someone else you have undertaken the most amount of risk in the situation, the borrower has the lowest. The bank is loaning the money based on your credit, not the borrower. Are you prepared for that? If not, don’t do it. 3. It can destroy relationships. Nothing drives a wedge between loved ones and friends faster than money and betrayal. And not paying back money is a betrayal. While saying no to someone may cause tension, becoming financially responsible for someone else’s loan can completely destroy the relationship and trust. If you end up paying the debt, you, at some point, will have to consider suing your friend or family member. 4. It can impair your ability to get a loan for yourself. One day you’re all set for that new house you’ve been eyeing only to find out you don’t qualify for a lower interest rate because you have a loan under your name, or it wasn’t paid, or it was settled for less than what was owed. 5. There are potential tax implications for settled debt. If a $35,000 loan is settled for $20,000 you could be responsible for claiming the $15,000 difference on your tax return as loan forgiveness. That doesn’t go under the credits column. 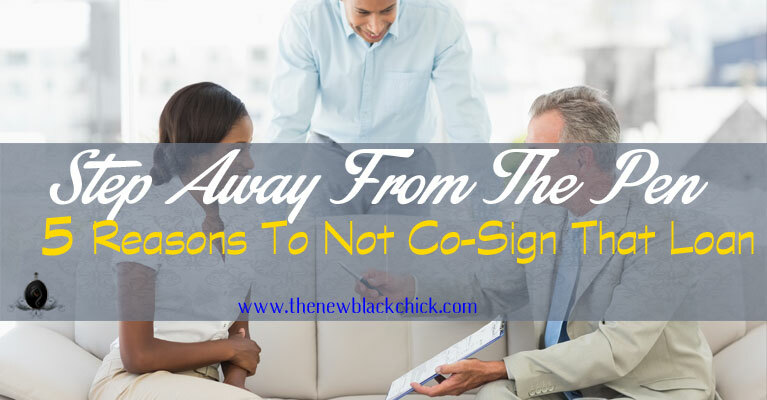 There may be good reasons for co-signing for someone else. Properly assess the risks of doing so. If someone isn’t paying their bills chances are they aren’t going to pay you. If it’s not to keep a roof over their head or food on the table, is it worth the risk? If you’re in a relationship with someone you aren’t married to without documentation they may say it was a gift when that first bill comes due. 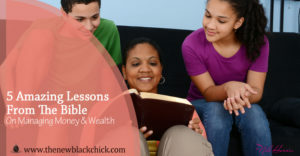 Protect yourself and your wealth. Please share your thoughts and this post within your communities.